I had the good fortune to participate at the launch of Mirrored Images, an anthology of Sri Lankan Poetry edited by Rajiva Wijesinha. The book was published by the prestigious National Book Trust of India. Prof Rajiva Wijisinha had already collected An Anthology of Sri Lankan Short Stories for NBT, beside, of course, his modest collection of Modern Sri Lankan Poetry in English. But this is a more ambitious work which has drawn from Sinhala. Tamil and English representative works. The volume which runs to 400 pages contains 138 poemswritten in Sinhala and Tamil translated into English and 72 poems originally written in English. Appropriately, Hon.Vasudeva Nanayakkara, Minister of National languages and Reconciliation graced the function. Present in the audience were senior writers, critics and media persons. “Genuine poetry”, said T.S.Eliot “can communicate even before it is understood” This was affirmed as I first read out the Tamil originals of my poems. At the launch. The audience, mainly non – Tamil, sat in husband silence because, I believe, the reading was infused with so much passion. Their understanding was complete with the English version that followed. Anne Rasasinghe, the veteran, (she is 80!) had to be helped to her seat but her reading was clear and well – articulated. A.Santhan read his Bigger match with a brief introduction about a correspondence that occasioned the poem. 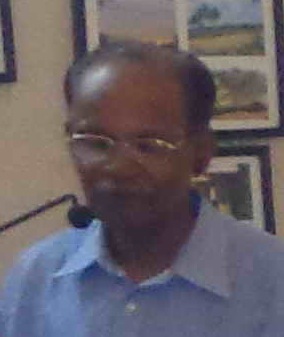 Ariyawasa Ranaweera read his Sinhala poems with the English translations done by the late E.M.G.Edirisinghe. I am familiar with the poems in his Echoing Ethos and had, in fact, translated some into Tamil. They appear in my Thennilankai Kavithai published in 2003. Ranaweera rises above petty prejudices that have plagued the thinking of our generation. A poem I wish to cite is “today’s Lion”. It takes a fresh, realistic look at the loin that flutters in our national flag. The historical / mythical lion can spilt the elephant’s forehead. It can harness waterways and build lakes! But according to daughter’s Zoology book, the lion is a lazy sleepy animal that lives on preys fetched by the lioness! “Today’s Lion” composed soon after 1983 is call for sanity in a land torn by tensions along the ethnic divide. Ranaweera also read his poem about India (ironically at the ICC). It is an appeal to India to respect the freedom and sovereignty of its small neighbor. The Jaffna launch was not just a replay of the Colombo function. 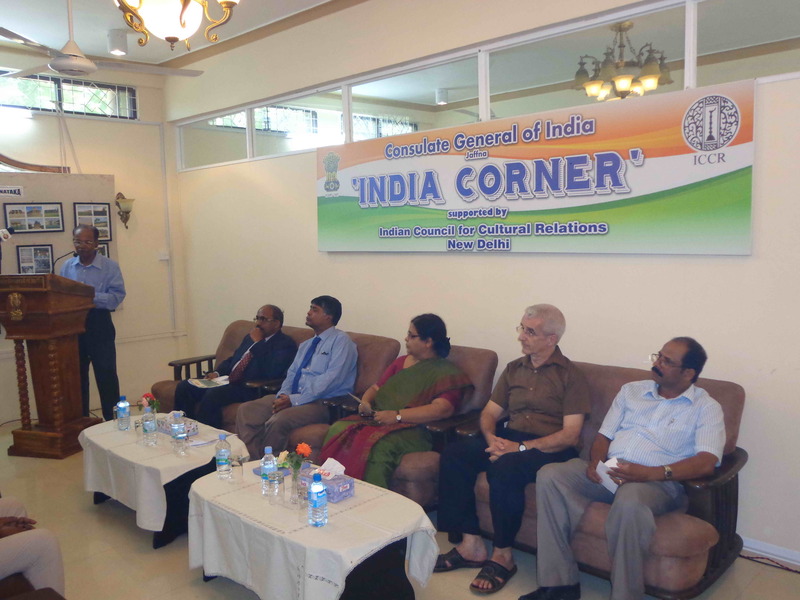 The Vice – chancellor of the University of Jaffna was the Chief Guest. Prof K.Visakaruban, Head, Dept of Tamil was the Guest of Honour while Dr Gerard Robuchon, Director of Alliance Francaise de Jaffna was the Special Guest. Ariyawansa Ranaweera had come all the way from Colombo to present his poems. Striking a personal note, he recalled the days he worked in Anuradhapura making visits to Jaffna off and on. Obviously he seemed happy and relaxed after a typical Jaffna lunch. ‘Sopa’ read his much – anthologized Release first in Tamil and then in English – his own translation. The poem is based on his own experience as a returnee (after a six – month exile). Luckily the house is intact – roof and all. Twice blessed: he had not stepped on a land mine! But, to his dismay, his pet ‘Blackie’ is not to be seen. Obviously, it had perished defending the house its master had abandoned. The poet is stricken with a sense of guilt. It was a powerfully moving poem. Rajiva wijesihna, the architect of Mirrored Images seemed more than satisfied. He obtained his Ph.D from Oxford and scholars of his calibre are very rare in deed. That he has taken upon himself the task of taking our creative writing to the western reader is itself laudable. But, what I consider more important is the objective of bridging the vast chasm that has divided the people who inhabit this beautiful island. Encouraged by the response to the launches, Rajiva, I understand, is planning to have to have a launch in Matara. Poets are the unacknowledged legislators of the nation. An acknowledged legislator (Rajiva Wijisinha M.P) has brought them together. It augurs well. For the short period of this life, like a bus halt. luminous lullaby from birth to death. Has Rajiva reconciled himself with reconciliating for Gota and Rajapakse? Let alone read poetry?